It�s important to realize that your skin is the largest organ in the body, and no matter what color it is, it requires pampering and care so that it can protect you into your later years. No one wants to age too fast, but by using unnatural products or worse, none at all, on your skin and body can do damage and make you look like you are much older than your years. African-American skin tends to have wonderful properties associated with it because it has more melanin making it able to withstand the sun more readily than other skin types. But, it can also have special skin concerns. These concerns should be treated with natural ingredients. Do you really want to trust putting a store bought lotion on your face that contains ingredients you've never heard of? Are you trying to treat an acne-prone face or a body that has developed some ashy tones in the winter due to the dry air? Is your hair suffering damage from the weather? Don't you want to know that you aren't irritating your skin, hair and body any more than it already might be? I didn't think so. Two common problems for African-American skin are acne and ashy skin. Below are ways to treat these skin conditions naturally. A common skin problem for African-Americans is acne. On darker skin, it can irritate and redden the skin. Scarring can occur and many times, African-American skin that has had acne can be left with hyper-pigmentation afterwards � making the once affected area actually appear darker and blotchy. Using products that contain benzoyl-peroxide are often recommended, but I recommend a calmer, more natural treatment. Try treating the acne with a product that uses green tea extracts to dry the blemish, and make sure it also contains antioxidants to treat and replenish your skin with its natural oils. Ashy skin is common for African-Americans, especially in the winter months. Many lotions and creams on the market contain petroleum jelly which acts as a layer on top of your skin but doesn't penetrate enough to really soothe and moisturize. Keep in mind also, that petroleum jelly is derived from petroleum, yes�oil. Not the type of oil you should ideally be putting on your face. 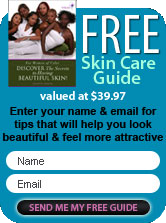 Remember, we want to think natural skin care for our African-American skin. That doesn't mean all natural is good � not if it's derived from a resource that is being overused and depleted. Natural treatments for ashy skin should include jojoba oil. An oil such as jojoba is said to be very similar to the natural oils on our skin and by using it in spare amounts can be a super-hero of moisturizers, removing flakiness. Use creams, lotions and oils that have this ingredient infused into it. African-American skin that's ashy will respond to your kindness by treating you with beautiful skin.